In the video below, Better Homes and Gardens offer tips on turning shady areas into colorful garden spaces. Hostas add interest to shade gardens with their wide selection of foliage sizes, shapes, and colors. If you enjoy native wildflowers, consider Virginia bluebells or bleeding hearts. The pinkish-blue bluebells and pink or white bleeding hearts appear in spring but then die back in June. However, perennial bluebells appear again next spring. Coral bells, formally known as Heuchera, grow well in partial shade and combine interesting foliage in purple, chartreuse, dark green, or mottled with silver with mid-summer blooms. Leucojum is a bulb to plant in the fall. Its pendulous white flowers will appear in May. Drought-tolerant Epimedium, also known as barrenwort, prefers dry shade. 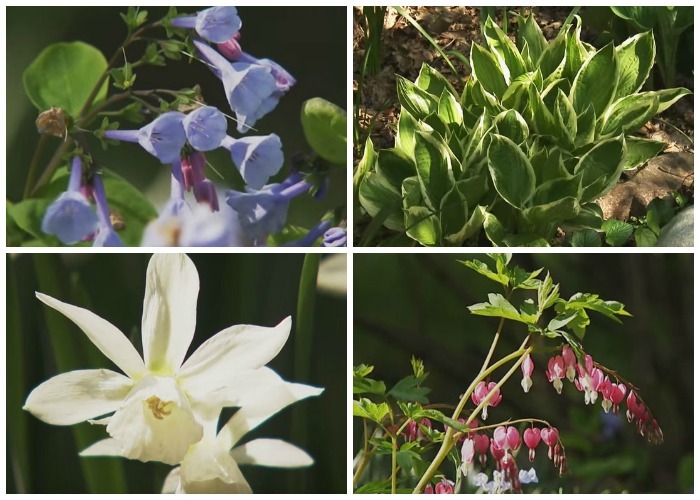 The spring blooms come in a variety of colors, and the leaves come in a variety of shapes. Some varieties are evergreen. Hellebore, also called winter rose or Christmas rose, produces pendulous blooms that appear very early in the spring and fade by midsummer. The blooms are available in a variety of colors. Spring-blooming Valerian is tough but delicate looking. Plant the bulbs in the fall. With its bright green, heart-shaped leaves hiding its small purple flowers, wild ginger is a great ground cover plant for shade gardens. If you have rich soil, Pulmonaria or lungwort adds patterned leaves that vary by species and delicate pink, blue, or white flowers to your garden. Plant narcissus or daffodils in the fall for blooms that appear even before the trees leaf in the spring. The various species offer a wide array of flower shapes and colors. These choices help to create the perfect garden.